So finally, let's look at these two Peripera peri's tint crayons that I have bought. 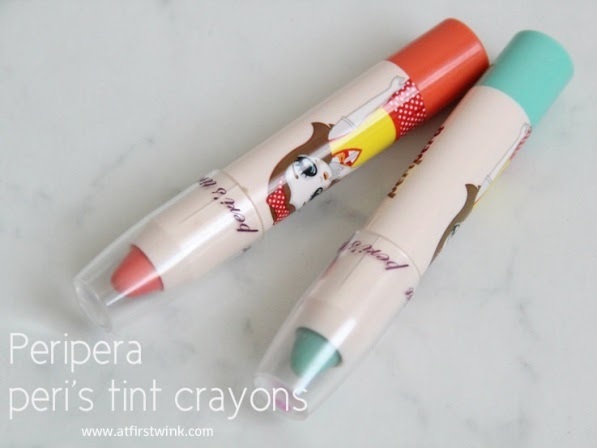 The Peripera peri's tint crayons come in three colors: Fruity Pink, Fruity Orange, and Fruity Mint and I got the last two. The plastic tube is exactly the same as the Clinique Chubby stick moisturizing lip colour balm that I have, just the cap is different. 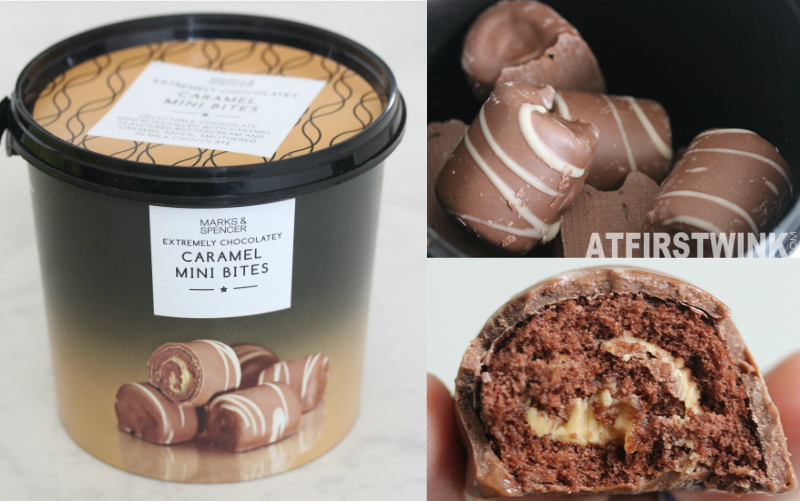 It has the same size and the twist-able end starts at the same point. The plastic cap of the peri's tint crayon however is transparent and it has the print "peri's tint" written around the edge twice. The Fruity Orange crayon naturally has a sweet orange scent and initially I thought that the Fruity Mint crayon was supposed to smell minty too, but it actually has a sweet tropical fruit scent. I love this scent the most out of the two. In the first row, you can find the pictures of the Fruity Orange and the Fruity Mint on my lips. The picture on the bottom left, is the gradient lip look that I created by wearing the Fruity Orange on my lips first and then applying the Fruity Mint on the inner parts of my lips. Update: you can see these three colors with the Dior Addict Gloss 433 - Delice on top in this post. I directly applied these Peripera peri's tint crayons on my chapped lips and it moisturized my lips very well and by the end of the day, my lips were still free of dry flakes. It feels very light on the lips (like it is barely there) and if you thought that the color is a bit lacking, I have applied the crayons a bit heavier in these two pictures underneath. As you can see, the color is buildable and you can apply as much as you want. Of course, I needed to take the other lip tint sticks that I own, out to compare. 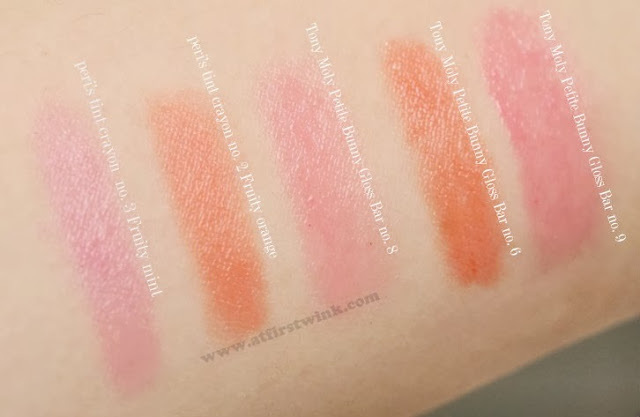 As shown in this Tony Moly Petite Bunny Gloss Bar lip swatches post, I own the no. 6, 8, and 9. The Tony Moly Petite Bunny Gloss Bars are slightly glossier and although the Peripera peri's tint crayon no.2 has almost the same color as the Tony Moly Petite Bunny Gloss Bar, the Tony Moly one is slightly darker orange. 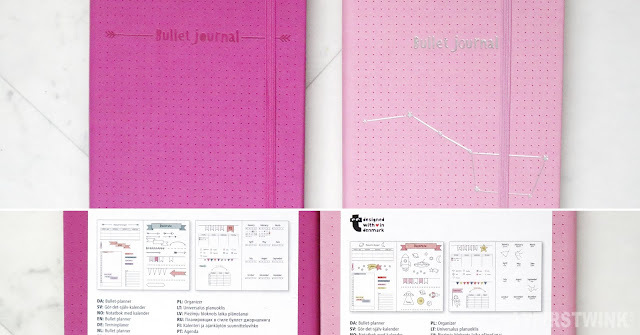 The pinks are entirely different from each other though. The Peripera peri's tint crayon no. 3 has a bit of a purple tone in the pink, the Petite Bunny Gloss Bar no. 8 is the lightest pink, and the Petite Bunny Gloss Bar no. 9 has a dark pink color. When I took a tissue to wipe the swatches away, the stains were comparable. I feel that the Peripera crayons are a bit buttery and more moisturizing, but they only win by a hair.